Last March, our Exploring Artism group looked at Edwardian beach portraits and talked about how to keep cool in the hot weather. We even made our own “ostrich” feather fans to take home and use! First we looked at two paintings by Laura Knight: Boys (Newlyn, Cornwall) and Flying the Kite. Looking at the two paintings, we talked about what the children are doing in each scene. We compared the various ways that the children are keeping cool: in Boys, the children have taken off a lot of their clothing and they seem to have been swimming in the lake in the background. In Flying a Kite, several children lie in the shade of a tree while others stand in the wind. Notice the clothing, the action, and the setting of each painting and how that contributes to our sense of the weather. Next we asked ourselves: What if you were inside a building and wanted to keep cool? 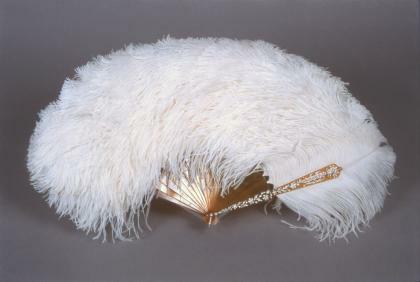 We moved to another piece of work in the Edwardian Collection to help us answer this question: Mrs. James De Rothschild’s Ostrich Feather Fan. Participants were asked to describe the fan: What do you see? What do you think it’s made of? Do you think it is heavy or light? How do you think it was made? We looked at other examples of fans (found here) and also talked about the ostrich (see here) to try to understand how it was made. Next, we left the galleries to go make our own fans to keep cool. 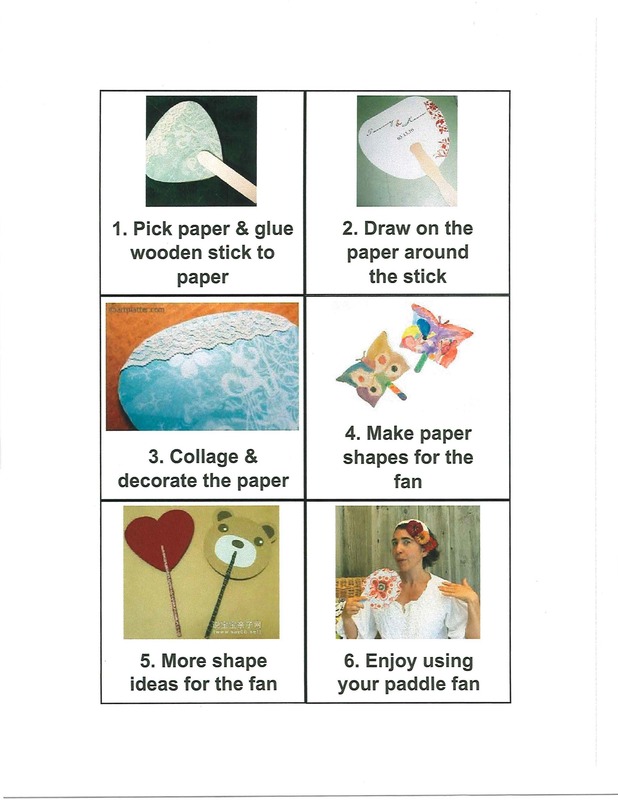 Participants had the option of making a paddle fan or a folded fan. To make the paddle fan: Select a piece of stiff card stock (a good size is about 5 by 5 inches) and round the edges. Glue a large Popsicle stick to one side to make the handle. Flip the card stock piece over and glue another stick parallel to the first. Feel free to add an extra stick as a brace. Decorate your fan however you would like: markers, paint, feathers, etc. 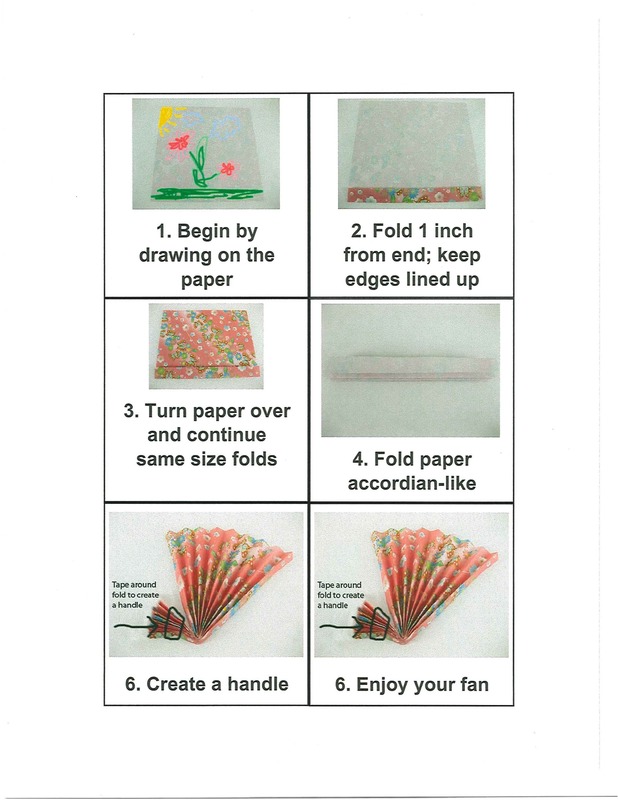 To make a folded fan: fold a rectangular piece of card stock back and forth in an accordion fold. Each fold should be about one inch in length, and the folds should all be even (line up top and bottom of both edges of paper). Then attach duct tape around the bottom to create a handle. Optional: Hole punch the end below the duct tape and loop a ribbon through to hang it from your wrist or belt. Everyone had the opportunity to share the fans that they created! Join us for our next Exploring Artism program at the Yale Center for British Art on October 19th from 10:30 to noon. The program is free; pre-registration required. Please contact the YCBA Education Department (203 432 2858) for registration. Hope to see you then! Learning About Emotions: Make a Face!